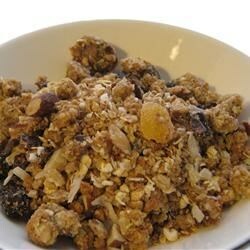 "My mother-in-law has made this wonderful granola cereal recipe for years. It's so flexible, and so much cheaper (and better) than the store-bought granola." In a medium bowl, blend brown sugar, vegetable oil, honey, and water. Mix in vanilla extract, cinnamon, nutmeg, and salt. Stir the brown sugar mixture into the oat mixture until evenly moist, and transfer to a large, shallow baking dish. Bake 45 minutes in the preheated oven, stirring every 15 minutes, until lightly brown. Mix dates, pecans, and coconut into the dish, and continue baking about 15 minutes. Allow to cool, and store in airtight containers. Good flavor, but too moist!!! It's not crunchy! I'd probably use oil for the water if I were to make this again. This is our favorite granola! The only change I made is to bake it for 1 1/2 hours, stirring once after the first 30 minutes. This cereal was great. I think I will make it and give it away as a gift. I used almonds, no dates, and oat bran instead of wheat bran. The taste was delicious.